Polyplexes, composed of Salmon DNA and very small gold nanoparticles embedded into a dendritic glycopolymer architecture of sugar-modified poly(ethyleneimine) (PEI-Mal) with a molar mass of about 25,000 g/mol, were characterized by dynamic light scattering (DLS), zeta potential measurements, micro differential scanning calorimetry (μ-DSC) and transmission electron microscopy (TEM). The PEIMal-entrapped gold nanoparticles of about 2 nm in diameter influence the polyplex formation of the hyperbranched PEI containing bulky maltose, and in consequence the DNA is more compactized in the inner part of spherical polyplex particles of about 150 nm in diameter. 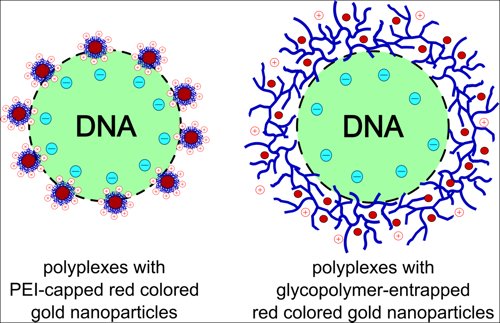 The resulting more compact coreshell polyplex particles with embedded gold nanoparticles in the outer polymer shell will be used as components in forthcoming gene delivery experiments.